The trend over recent years of increasing Antarctic sea ice extent — seemingly at odds with climate model projections — can be mostly explained by a natural long-term climate fluctuation, according to a paper published this week in Nature Geoscience. The study, led by Colorado’s National Center for Atmospheric Research with co-authors at the University of Washington and other institutions, may resolve a longstanding mystery: Why is Antarctic sea ice expanding despite climate-related global warming? The study offers evidence that the current negative phase of the Interdecadal Pacific Oscillation, which brings cooler-than-average sea surface temperatures in the tropical eastern Pacific, has created favorable conditions for additional Antarctic sea ice growth since 2000. 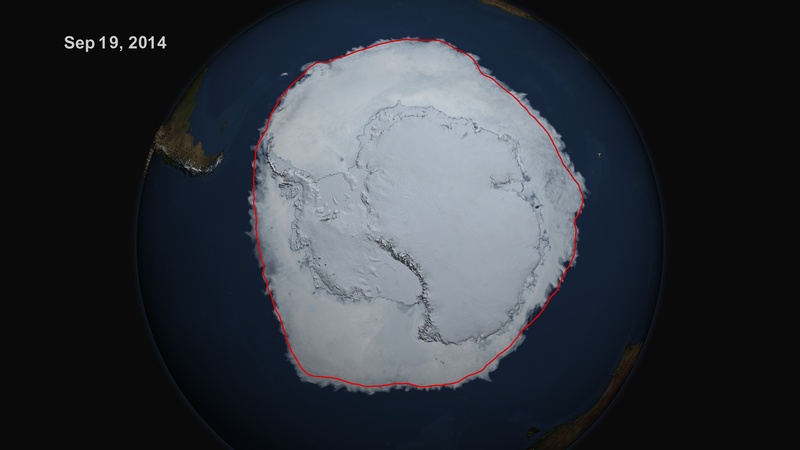 The winter sea ice around Antarctica is particularly susceptible to its influence. The sea ice surrounding Antarctica has been slowly increasing in area since the satellite record began in 1979. But the rate of increase rose by nearly fivefold between 2000 and 2014, following the IPO’s 1999 transition to a negative phase. The new study used climate models that capture this transition to show that when the IPO changes phase, from positive to negative or vice versa, it touches off a chain reaction of climate impacts that may ultimately affect sea ice formation at the bottom of the world. When the IPO transitions to a negative phase, the sea surface temperatures in the tropical eastern Pacific become somewhat cooler than average when measured over a decade or two. These sea surface temperatures, in turn, change tropical precipitation, which drives large-scale changes to the winds that extend all the way down to Antarctica. The ultimate impact is a deepening of a low-pressure system off the coast of Antarctica known as the Amundsen Sea Low. Winds generated on the western flank of this system blow sea ice northward, away from Antarctica, helping to enlarge the extent of sea ice coverage. The authors suspect that in 2014 the IPO began to change from a negative to positive phase, and that sea ice growth may begin to slow and winter sea ice may shrink over the next decade as the oscillation switches to its positive phase and global warming continues. Other co-authors are Julie Arblaster of NCAR and Monash University in Australia, Christine Chung at the Australian Bureau of Meteorology and Haiyan Teng at NCAR. The study was funded by the U.S. Department of Energy and the National Science Foundation. Adapted from an NCAR press release; read the full version.